from May 10 through June 29. Once again, work by an Imagine! artist will be featured out in the community. Over the past few weeks, Imagine! clients in an art class run by Imagine!’s CORE/Labor Source department and taught by Bridget Carroll have been expressing their creativity by creating their very own masks. One of masks will be included in the Longmont Muse Gallery’s exhibition UnMasked: The Language of Cultural Identity. The exhibition will feature masks by artists with their interpretation of cultures and symbolism from around the world as well as traditional ceremonial masks from Mexico and South America on loan from the Museo de las Americas. As part of the exhibit, the Community Space of the Muse will feature masks created by local nonprofits and community organizations. The masks are being designed to illustrate the various cultures of participating organizations. In addition to Imagine!’s mask, other organizations who will be contributing masks include Our Center, the Inn Between, the Longmont Community Foundation, the Longmont Humane Society, and the Longmont Community Justice Partnership. The exhibit will run from May 10 through June 29. The Muse Gallery is located at 356 Main St in Longmont, and its hours are Tuesday through Friday from 11 am to 5 pm, Saturday from 10 am to 4 pm. It is also open until 9 pm on the 2nd Friday of each month. Admission to the gallery is free. Today’s installment of “50 Years, 50 Stories” comes from Ed Schlichting, who began receiving services from Imagine! back in 1974. You will see that Ed leads a very active life, and contributes to his community in many ways. This story was the result of several interviews conducted with Ed, and was done prior to Out & About’s annual Centre Stage performance, held on March 1. By the way, Ed was fantastic in the play! I came to Imagine! in 1974 and lived at Imagine!’s Kelwood Place, which was at 13th and College in Boulder on Uni Hill. Later, I got to meet people such as Ricardo Haskins, Brenda Denzel, Jane Laughlin, Julie Hartman, and the counselors. In one of the years, we had a weird counselor. He just decided one weekend that we’d go on a trip, and on this trip we didn’t get to bed until 2:30 at night. We went to Aspen. When we got back, we were greeted by Brenda, saying, “Where have you guys been?” Word then got to Imagine! staff. One of the things that happened the very next day is that I had a job at Beech Aircraft. I took a nose dive in airplane parts as I was stamping them. At one of our next Kelwood meetings we decided not to do any more of that. End of story. After that I moved to Imagine!’s Manhattan Apartments in 1984. In 1987 I got chosen to go to Special Olympics International. On the trip we had two problems with airplanes. The first one, we were sitting in Stapleton for an hour and ½, and the copilot quit so we had to wait for another one. Coming back home after the games, we got to Chicago and when we were leaving the gate and being pushed back onto the tarmac, the tow bar broke. I got to go to South Bend Indiana, and the competition was at Notre Dame. The coolest thing was after our softball team won a gold medal (I was the pitcher), we decided to watch the basketball team win gold. That was a team from Colorado. Presenting the gold medals was my teenage idol, Maureen McCormick (Marsha, from the Brady Bunch TV show). Two months after winning the gold medal, I got to move to Imagine!’s Canyon Creek Apartments. In 1995 I was watching a display in ham radio, and after this I became a ham radio operator. I am now a part of BCARES, which is Boulder County Amateur Radio Emergency Services. After I got my ham radio license, I now do special work with Boulder County. I got to work at CU football (we filmed the crowd) at CU football games. I am one of the many few that hold an extra class license who are handicapped. ﻿﻿I am still going on the Hill and looking around at old stuff, and boy did they ever remodel Kelwood. It is now a student home for the University of Colorado. I’m also having fun with Best Buddies. Best Buddies is in affiliation with the University of Colorado and Imagine! and not affiliated with Out & About (which I’m part of) as it is a special service that the university provides. 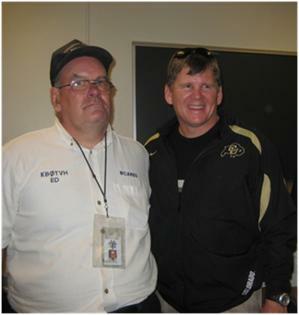 I got to meet who was then University of Colorado Head Coach Dan Hawkins and got a photo with him. He liked when I let him know that I helped out making the football games safe. It sure is fun getting to see people from yesteryear, such as Julie, and Rick, and all the people I mentioned above. Having fun reminiscing about old stuff. 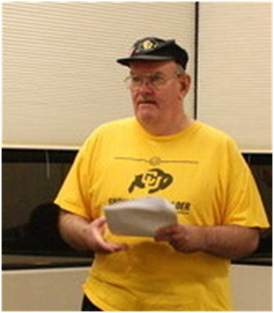 Two people that used to live at Kelwood have passed away, and I always had fun watching wrestling with them -- Pat W. and Teddy S.
I’m going to a rehearsal right now for a play that I’m going to be in. It is Thriller/Hotel Transylvania, and the play will be March 1st, at 7:30, at the Broomfield Events Center. My parts in the play are I’m a flight steward, then a bellhop, then an investigator, and back to bellhop again. I’m an honorary drum major in the CU marching band, too. I’m having fun with one of my lines. Everywhere I go, I’m always hearing it, “Oh my aching back.” It might even be done tomorrow night at a dance I’m going to with Friday Night Out. Tonight we’re working on our costumes, and we get our pictures taken by a photographer from the Broomfield Enterprise telling about the play. And tomorrow night, I’m going to be wearing my Amtrak uniform, full-fledged, as it will be my month prior to working with Amtrak as a cop for one year. Since the beginning of history, Peabody’s Improbable History that is, the concept of being held accountable when acting as a paid representative for a group of citizens has been an acknowledged value. I think most would agree that in the field of funding and serving individuals with intellectual and developmental disabilities (I/DD), accountability is paramount. If a person is to act as a paid representative for this vulnerable population, that person must be accountable for all actions that he or she undertakes on behalf on that population. Should we expect the players of Improbable History to engage in role reversal? Role reversals should be accountable, transparent, and reported. Thirty years from now Peabody and Sherman will use the WABAC machine to return and relive our decisions, discoveries, and our own role reversals. You would think they would find that all of us – providers, CCBs, government agencies, regulators, and paid advocates - have the end-user in mind at all times. Then again, providers have a bottom line, government agencies must work within statutes and government structure, CCBs have regulatory compliance, and paid advocates … well, paid advocates still are expected to keep the end user in mind at all times. So what they might find instead is players engaged in role reversals and trading places, voices, and stakeholders. I have recently found myself in such a situation, where I was playing the role of advocate (an out of body experience, you might say), a paid advocate was playing the role of government, and government officials were playing the role of provider. If only we had Peabody to straighten us out. You know what I’m thinking? It’s time to adjust the WABAC machine. How? Check in with anyone who you think is speaking on your behalf. If you are speaking for others, be explicit. Don’t start with “I think …” Rather, start with, “The people I represent would say …” If you are facilitating a meeting, insure the attendees state who they are representing to insure the right people are at the table. We’ve moved past the information age into the communication age. Technologies exist that allow organizations and individuals to communicate and collaborate in ways not possible a few short years ago. Let’s hope Peabody and Sherman find that everyone in this field is transparent, accountable, and reporting their actions. Volunteers through Angel Organic, which has a mission to "cultivate and nurture a meaningful path to integrative health and healing practices within underserved individuals and communities," have been teaching a yoga class for the residents at Imagine!’s Bob and Judy Charles SmartHome for the past few weeks. You can see how much the residents enjoy the class by checking out the photos below, taken at a class held April 10th at the home. Our sincere thanks to Angel Organic and yoga instructors Laura and Michael. Angel Organic volunteer Laura slowly and gently helps Donna stretch her arms high into the air. Laura has Mandy reaching out her hands to grab Laura’s hand. Mandy is enjoying this stretch with Laura’s assistance. Donna said, “I’m a twisted pretzel,” as Angel Organic volunteer Michael helps her with this stretch. This week’s “50 Years, 50 Stories” entry comes from Pat McNutt, the mother of a woman who has been served by Imagine! for quite some time. It is short and sweet, and I thank Pat for sharing. Our family came to Boulder in 1968 with six children, no house, no jobs. We really wanted to live in Colorado! It’s been an adventure. The main reason we chose Boulder was our daughter Susan who, at that time, was nine years old. After checking with the Chamber of Commerce and other sources, we found that Boulder had a very good program for “trainable mentally retarded people’’—the term used at that time for her needs. Within a few weeks in Boulder, we had a nice, large home, a job for my husband, Jerry, and our Susan was getting settled in at Ruth Wood School. She was there until she was 21 years old and graduated. Then she was with Life Enrichment and Labor Source and now Innovations—all programs of Imagine!. Through the years we have been involved with Imagine! and the BCBDD (Boulder County Board for Developmental Disabilities - an earlier name for Imagine!.) 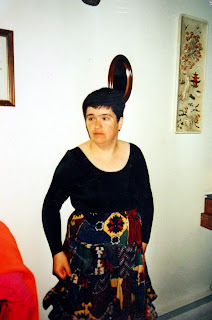 we have met and been helped and encouraged by so many wonderful people, and Susan thrived. We are grateful to all the caring people at Imagine! who have enriched our lives. Are you interested in sharing your story for 50 Years, 50 Stories? If so, contact Caroline Siegfried at caroline@imaginecolorado.org or 303-926-6405. We’d love to hear from you! Next Thursday, April 18, Imagine! will be hosting its 2013 Provider Fair. This is the first Provider Fair we have hosted in over four years, and it will be an exciting opportunity for families and clients to connect directly with a variety of service providers to help determine how funds for the next year will be spent. The Provider Fair will include raffle prizes, giveaways, light refreshments, and opportunities to meet with Imagine! coordinators, navigators and case managers. There will be opportunities to learn about the Children’s Medicaid Buy-In Program and the new Colorado Community Health Alliance, as well as family and self-advocacy groups. If you plan to attend, please SIGN UP HERE or call Carla Rapp at (720) 274-2248 with your RSVP. While sign-ups are not required to attend, your response will help us in adequately preparing for this event. For further information, please contact: Carla Rapp at chrapp@imaginecolorado.org or (720) 274-2248 or Lucy Williams at lwilliams@imaginecolorado.org or (303) 926-6444. *Note: Spanish interpreters will be available to assist, as needed. ASL interpreters will be available upon request. Childcare/supervision will not be available. Today’s “50 Years, 50 Stories” installment comes from Chris Collins, who is the Executive Director of Alliance, a nonprofit, statewide association of Community Centered Boards (CCBs) and Service Provider Organizations (SPOs). Chris has long been a leader in improving the lives of individuals with developmental disabilities, and I thank her for all she has done for some of our State’s most vulnerable citizens. 40 Years Of Association With Imagine! I have been indirectly or directly involved with Imagine! for more than 40 years. My perspective is both as a fellow CCB Executive Director and as Director of Alliance, the state association. It has been an incredible journey being a part of the community system for people with developmental disabilities in Colorado. Imagine!, formerly the Developmental Disabilities Center, has been a leader throughout its 50 years. You can always look to Imagine! for innovation , community involvement, and high quality services and supports. I first worked with Imagine! when I was involved with starting Horizons, the Community Centered Board (CCB) in NW Colorado. We had a small but dedicated staff and on more than one occasion we reached out to Imagine! for information and assistance. We couldn’t afford to reinvent the world so we turned to CCBs that had been around for a while and knew the ropes and were willing to help us. Imagine! never said no and was always there to help guide us. This willingness to assist others both within their communities and at the state and national level is a hallmark of Imagine!. So that takes me into my current role with Imagine!. Imagine! is an active member of Alliance, the state association whose members include CCBs and Program Approved Service Providers. Imagine! leadership and staff have provided leadership at the state level in securing funding for people with developmental disabilities, actively influencing legislation, developing policies, and working to streamline the community system. We have called on Mark Emery and several of his staff to testify on an important bill at the state Capitol on many occasions. Mark and his incredible staff serve on many state level committees and have been a driving force to make positive change to the lives of people with developmental disabilities not only in their home communities but across the state. It is also important to note they are actively involved at the national level in influencing policy and, as many of us know, through their SmartHomes are involved worldwide. Technology and innovation are cornerstones of Imagine! and the work it does, but Imagine!’s focus is always to improve the lives of those it serves. What a journey, Imagine!. I have no doubt you will continue to evolve and lead the way for another 50 years. One of Imagine!’s goals is to provide individuals with one or more developmental disabilities the skills and tools they need to become contributing members of their communities. That is why I am so pleased to share that in late March, Imagine!’s Out & About department debuted “Community Access,” a class designed for adults to increase their independence in the community. Led by veteran instructor, Raeann Smith, this new forum will host nine sessions on Thursday mornings through May. “I know how valuable it is to feel like you could go somewhere independently and I hope to help others work towards feeling that same independence in the future,” said Raeann. Having spent a year in South Korea teaching English, Raeann has recent experience learning how to navigate through a big community and how to make the most of its resources. She is bringing that knowledge to the course. In addition, class members will meet with Police Officers and Fire Fighters to discuss safety. Raeann aims to help participants learn new skills on personal safety and a better understanding about organizations that keep us safe, such as the Police and Fire Departments. “The focus of the class is to identify individual goals in regards to how they want to better access their community and start from there,” said Raeann. I’m looking forward to hearing more about the class. And here’s some bonus good news from Out & About. The department has recently been featured in a local newspaper and magazine. Click here to read a story from the Broomfield Enterprise about a recent play written and performed by Out & About participants. Click here to see a story about Out & About’s Movement and Rhythm class from Yellow Scene Magazine’s March edition. This week’s installment of “50 Years, 50 Stories” is short but sweet. Really sweet - Christa Overlease shares the story of meeting her future husband while working for Imagine!. That kind of story is surprisingly common at Imagine!. I know of several couples who met, and fell in love, while working here. I think one reason is because many of Imagine!’s Direct Support Professionals (DSPs) work in challenging jobs where you rely heavily on fellow employees in order to achieve success in situations that can be very challenging. Under such circumstances, it is easy to get to deeply know and understand co-workers in ways that can otherwise take months and years to learn. And if what you learn fits what you are looking for in a life partner, then love can bloom! Christopher Overlease and Christa Odegard first met while he was helping to train her at Imagine! 's Twin Lakes PCA in October 2007. They knew they were meant to be together forever soon after they started dating. The pair bought a house and became engaged the following year. In September 2009, they became Mr. and Mrs. Overlease. After honeymooning in Greece, Turkey, and Germany, Chris began working as a Host Home Provider for Imagine!. About a year later Chris and Christa welcomed a son, Brayen, on 10/10/10! They are currently expecting a daughter to be born on May 30, 2013, a day before Christa's birthday (5/31). Chris still enjoys his position as a Host Home Provider for Jenn and Tom. Jenn has lived with the couple since they were married and has experienced their joys of life with them for the past three years. Tom moved in a year and a half ago and is happy to call the Overlease residence his home. Christa is currently working at Imagine!’s Charles Family SmartHome as a Residential Counselor and recently received her teaching license in Special Education. Salmon eggs are laid in freshwater streams typically at high latitudes. They live in rivers for about two years before making their way out to sea. After spending one to five years out in the ocean, they return to the same river where they were born using chemical cues and battle their way upstream to the spawning areas - the idea being that if the area was good enough for them, it will be good enough for their offspring. One of the reasons this process fascinates me is because, well, it seems so difficult. Check out the video below of some salmon trying to move upward against some pretty fast (downward) flowing water. It doesn’t seem like a walk in the park, does it? I’d like to state for the record that I don’t think that constantly struggling to go upstream is an effective approach to finding new and innovative ways to serve some of our most vulnerable citizens. We don’t have to fight the current all the time, just because that’s the way we did it last time. In fact, it is usually a heck of a lot easier to go with the flow of the water and to let the river guide us as we move forward. In order to make that happen, however, we need to establish an organizational culture that is based on learning. A culture of curiosity. We must be skilled at creating, acquiring, and transferring knowledge. The words “change” or “training” send a shiver up my spine. Learning on the other hand, is soothing to me. Chances to do something better, more effectively, more intelligently, and more easily. What’s the by-product of learning? Change. Change is difficult if you view it as an action and you are constantly trying to fight it; you are constantly trying to swim upstream. But we don’t have to constantly swim upstream. We can do better than salmon functioning strictly on instinct and chemical cues. We can embrace the flow of the river and take the path of least resistance, accumulating new knowledge, skills, tools, and strengths along the way. And the result is … change. I encourage all Imagine! employees, and all those who work in the field of serving individuals with intellectual disabilities, to embrace a culture of curiosity and learning. To never even consider saying something along the lines of, “I don’t want to learn this new thing.” In the long run, it is easier to learn than it is to resist, and with new knowledge we have the possibility of making our own lives, and the lives of those we serve, so much better.